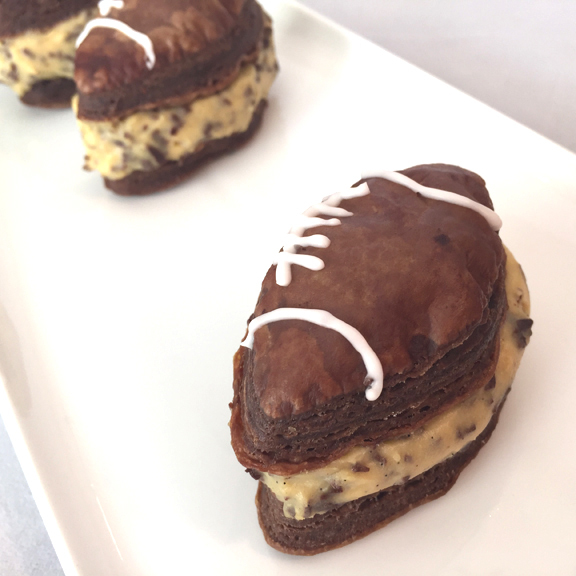 Get “game day ready” with our quick and easy Football Pastries! Perfect for your next tailgate party, our cute football shapes are loaded with a delicious filling and will look great on your tailgating table or platter. Filled with delectable chocolate chip & vanilla pastry cream, these treats will satisfy anyone’s sweet tooth. For a special treat, fill your football shapes with softened ice cream and store in the freezer until ready to serve. You can purchase Dufour Chocolate Puff Pasty locally at Whole Foods. Defrost the puff pastry over night in the refrigerator. Preheat the oven to 375 degrees. Remove the dough from the packaging and lay out on a cutting board. Using a cookie cutter cut out as many shapes as you can to have an even amount. Place the cut outs on parchment lined cookie sheets and bake for 15 minutes. Turn the oven off, open the door and leave the puff pastry in the oven for 10 minutes. Remove and cool completely. Fill a large bowl with ice cubes; place smaller metal bowl inside and set aside. Bring milk, vanilla bean pulp and pod to a simmer. Remove from heat and set aside. Whisk yolks, sugar and cornstarch together in a heavy-bottomed saucepan. Whisking constantly, drizzle in one-quarter of the hot milk. Add the rest of the liquid in slow steady stream. Increase the heat to medium, remove the pod and, whisking vigorously, bring mixture to boil. Cook the mixture until it thickens and coats the back of a spoon. Remove from the heat and stir in the butter. Pour into the bowl set over ice and cool completely. When cooked, add the finely chopped chocolate. Refrigerate until very cold. Place the pastry cream in a piping bag. In the microwave, melt the white chocolate. Add to a piping bag, and add laces to half of the puff pastry football shapes. Refrigerate to set the laces. To finish, using the remaining shapes, pipe to thickly cover with pastry cream, top with the football shapes with laces. Refrigerate until ready to serve.